I am turning into a regular outer-borough-going type person. Two days ago, I rode my bike over the Queensboro Bridge (slightly scary but feelin' groovy) and explored Long Island City (definitely scary) . T'was my first Queens experience, other than taking the AirTrain to JFK. 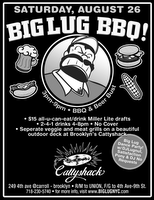 And tomorrow, Saturday, my crew is gonna trek to BK for the Big Lug bear picnic. Next stop, Staten Island. W00t!